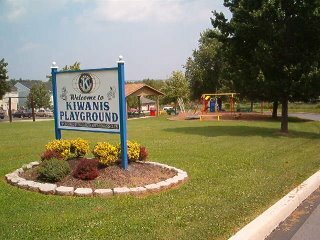 The Kiwanis Park is located in the south east corner of Nazareth. On Sunday my daughters and I stopped there to take a break during their bike ride. A pavilion with a four to six picnic tables is surrounded by a swingset, slide, sandbox and a few play areas. There is a lot of grass, though most is on a slope, and an area to shoot baskets, though not a full court. It is a nice, quaint park area for the nearby residents and is well maintained. The girls had the park nearly to themselves with two other girls playing at the time, giving them their choice of things to do. East of New Street, the park is bordered by Franklin (Changes from South to Franklin after the intersection of South Street and New Street). That park would be perfect for a new building. I profiled this one as I will several others, because Nazareth at some point had the foresight to have many local community parks, just as Philadelphia did thanks to Franklin. It's one of many things that makes this community great. While I hope you are being facetious, we're already losing the green space just to the west of the park for the new Alexandria Manor facility. Not on public property, so a bit more difficult to contest. Thanks for visiting and taking a sip of newsovercoffee!